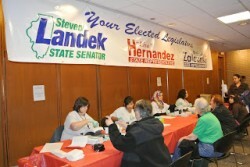 State Rep. Michael Zalewski and State Senator Steven Landek joined State Rep. Lisa Hernandez is hosting a Diabetes Awareness Fair Saturday March 16. More than 130 people attended the free event. One of the popular booths was the free Kidney testing held in a special mobile testing lab that travels throughout the state. Among the many at the fair were Alivio Medical Center, Central Dental Associates, County Care, IDPH, MacNeal Diabetes Center, Novo Nordisk, Partnership for Prescription Assistance, PAV YMCA, Safe Families Americorps, Vitamin Shoppe, and Walgreens. Visitors to the fair were given opportunities to talk to all these vendors and to be tested. “With the rising costs of healthcare for families, many do not have comprehensive healthcare or the ability to obtain preventive care so the Diabetes Awareness Fair is an important event,” Hernandez said.